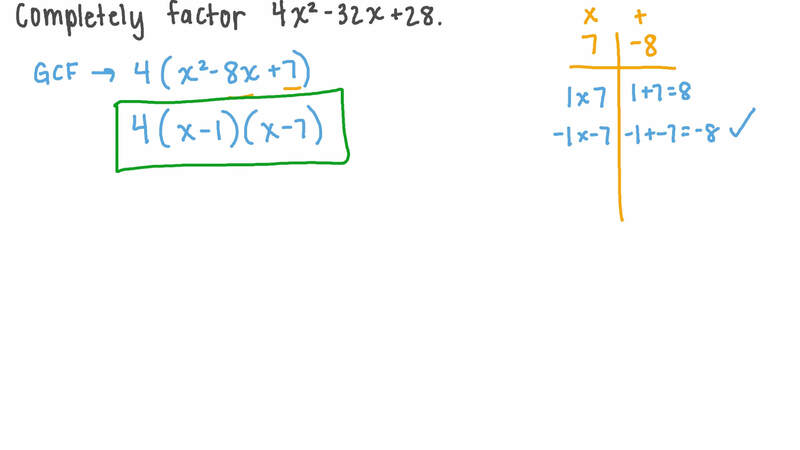 In this lesson, we will learn how to factor quadratics where the coefficient of the leading term is greater than one. Factorise fully 4 𝑥 − 3 2 𝑥 + 2 8 2 . Factorise fully 6 𝑥 − 1 9 𝑥 + 1 0 2 . Solve the equation 4 𝑡 − 3 2 𝑡 + 6 4 = 0 2 by factoring. 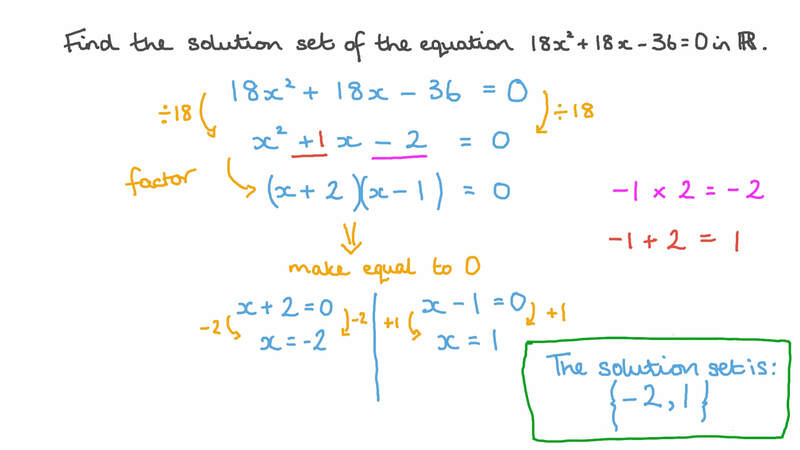 Find the solution set of the equation 1 8 𝑥 + 1 8 𝑥 − 3 6 = 0 2 in ℝ . Find the solution set of in . Given that − 1 0 is a root of the equation 2 𝑥 + 1 3 𝑥 − 7 0 = 0 2 , what is the other root? Find the solution set of 2 𝑥 + 5 𝑥 − 7 = 0 2 in ℝ . Solve the equation 2 ( 𝑥 + 1 ) + 5 ( 𝑥 + 1 ) = 0 2 . Find the solution set of ( 2 𝑦 + 4 ) + ( 𝑦 + 2 ) = 5 2 2 in ℝ . Find the solution set of 𝑥 ( 𝑥 + 5 ) 4 − 𝑥 ( 𝑥 + 1 ) 8 − 3 ( 𝑥 + 4 ) 2 + 1 = 0 in ℝ . Find the solution set of − 7 ( 𝑥 + 7 ) + 9 ( 𝑥 + 7 ) = 0 2 in ℝ . The roots of the equation 𝑥 − 1 0 𝑥 + 1 6 = 0 2 are 𝐿 and 𝑀 , where 𝐿 > 𝑀 . Find, in its simplest form, the quadratic equation whose roots are 𝐿 − 7 and 2 𝑀 − 6 2 . Find the solution set of the equation 3 𝑥 − 9 𝑥 + 6 = 0 2 , giving values to the nearest tenth. Find the solution set of 𝑥 + 9 3 𝑥 + 3 8 = 1 2 2 in ℝ . Find the solution set of ( 3 𝑥 + 6 ) = ( 5 𝑥 − 1 1 ) 2 2 in ℝ . 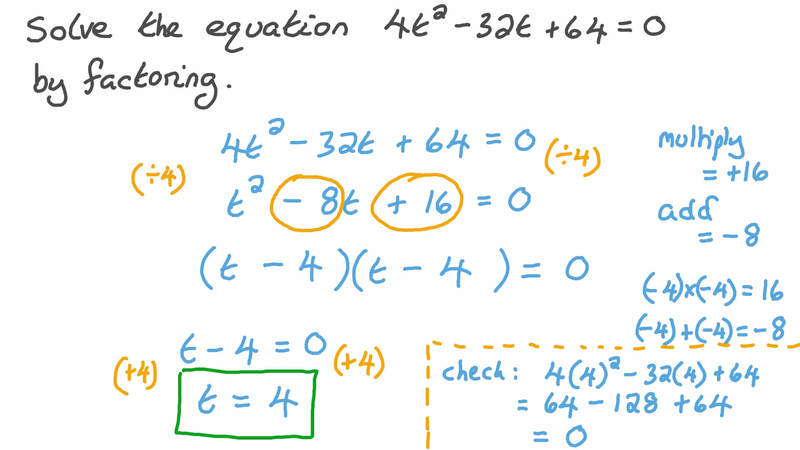 Find the solution set of 1 4 4 𝑥 = 3 6  in ℝ . Find the solution set of 2  𝑥 + 3 2  = 7 2 2 in ℝ . Given that 𝑦 + 1 𝑦 = 7 9 2 2 , find 𝑦 + 1 𝑦 . Solve 1 6 𝑥 − 2 4 𝑥 + 9 = 0 2 . Deduce from the previous question the solution to 1 6 𝑥 − 2 4 𝑥 + 9 = 0 2 , using a change of variable. Find the solution set of 5 𝑥 + 1 2 𝑥 = − 7 2 in ℝ . Find the solution set of − 2 𝑥 + 2 = 0 4 in ℝ . Given that 𝑎 𝑏 = 𝑏 𝑐 = 2 , find the solution set of the equation 𝑎 𝑥 − 2 𝑏 𝑥 + 𝑐 = 0 2 . Solve the equation ( 2 𝑥 − 3 ) ( 3 𝑥 + 4 ) = 0 . Solve the equation 4 𝑥 + 4 0 𝑥 + 4 0 = − 6 0 2 by factoring. Solve the equation 5 𝑥 − 1 4 𝑥 + 1 0 = 1 5 2 by factoring.